In the 1924 silent film, “The Arab,” a charismatic sheik woos an adventurous ingénue traveling with a group of hapless American tourists. Part travelogue, part love story, the film does offer up implicit commentary. Part of their tour includes a visit to the resident Protestant missionary, whose words are drowned out by the call to prayer coming from the village minaret. American film historians had never seen this film until recently. Eighty percent of silent films made during the silver age of cinema from the 1890s to the 1930s did not survive in the United States, leaving archivists with bits and pieces of nitrate reels to try and capture and imagine an entire era. But some films did survive elsewhere. A copy of the film was one of ten films repatriated, a recent gift from Russia. Professor A. P. Vershinin, General Director of the Boris Yeltsin Presidential Library, gave a gift of digital copies of ten films to Dr. James H. Billington and the Library of Congress in late 2010. The gift also included a lost version of “Carmen,” sung by Geraldine Ferrar of the Metropolitan Opera. Today, film historians are beginning the painstaking process of restoring these films in a 400,000-square-foot concrete fortress in Culpepper County Virginia. “No one has seen these films in 5O years or more,” said Patrick Loughney, who heads the Packard Campus for Audio Visual Conservation and leads the Library’s effort to preserve films from the 20th century. “The very first step is to recover the films,” he said. “Restoring the films is another process.” The facility, which includes an erstwhile Federal Reserve bunker in the case of nuclear attack, was built in 2007. One hundred and twenty staff members work on preserving millions of feet of film from the last century. The first step in preserving the film “The Arab” will be to “dis-assemble the Russian film to try to recreate the original film,” according to Loughney. He is trying to find out if there are any synopses to work from as they try to translate the Russian back to English again. This will be done by a specialist who is familiar with the Paramount pictures of the day. 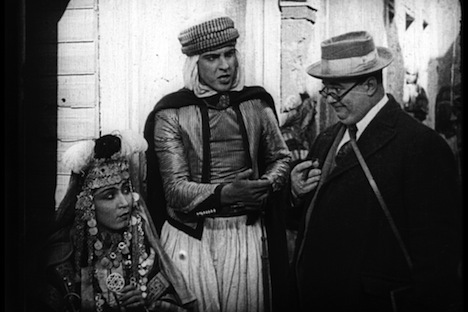 The main characters in “The Arab” have the stock magnetism associated with silent films—the dashing sheik, the knowing prostitute, the ugly American businessman. Yet some of the cinematography is breathtaking, from North African landscapes to village footage including women in the background wearing traditional Muslim dress, walking the sandy streets and stone tenements; the movie was filmed on location, probably in Algiers. Russia has about 194 silent films long lost to American historians. About 1,300 American films were distributed in Russia and the Soviet Union between 1913 and 1941. It’s not clear how much these ten repatriated films were distributed within Russia, but they have all replaced the English with Russian. Some of the Soviet versions had introductory warnings that the morals in the films were reprehensible. In an interview during his visit to Washington, D.C. last year, Prof. Vershinin said that his staff is developing a Russians in America history project for their digital library. “We hope to find out more about how Russians came of age in America,“ he said at the time.